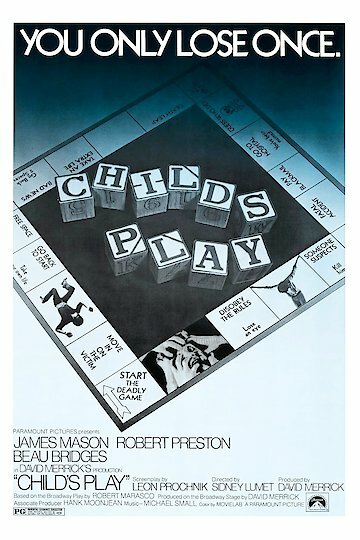 Child's Play is a 1972 American drama and mystery film about rivalry. The friction slowly builds between two school faculty members at an exclusive, high dollar Roman Catholic boarding school for boys. One of these faculty members is named Joe Dobbs, who is a non strict, charming, and very well liked English teacher, that is also the junior class leader. His feuding partner is the Latin and Greek teacher named Jerome Malley, who is the exact opposite of Joe Dobbs and is standing in the way of Dobbs becoming the senior class leader. Jerome Malley is overly stressed because he is providing care for his mother, who is on her deathbed. One day while he is taking care of her, his stress is elevated when he receives many anonymous calls and hand written notes that are very threatening. Since him and Joe Dobbs have previous conflict (when Dobbs tried to convince him to be less strict on the students and the fact that Dobbs is trying to get Malley to retire), he is convinced that Dobbs is the culprit. However, since Malley is hated by the other boys and has a bad reputation, he does not win any sympathy or support from anyone. Despite their feud, there is bizarre behavior coming from their students themselves. A new guy named Paul Reis joins their school faculty team, he is a former student at the exclusive boarding school and has been hired to teach the Physical Education classes. Despite his easy going personality, he finds himself in a power battle between Dobbs and Malley, and has to choose a side. Choosing a side is hard for Reis because at first, he believes in Dobbs's motivation, but then his thoughts are changed because he understands why Malley is tormented. The longer that he stays at the school, he realizes that the reason the boys are acting so strange and destructive is because they may be practicing demonic possession on one another. Child's Play is currently available to watch and stream, buy on demand at Amazon, Vudu, Google Play, FandangoNow, iTunes, YouTube VOD online.